BrandGPS is our proprietary brand framework process. Learn more below. Our brand development and management process is BrandGPS.® This bespoke 3-phase process systematically creates the Unique Brand Proposition (UBP). The UBP becomes the foundation for identifying untapped growth potential and developing outstanding and compelling communication strategies. BrandGPS is executed in three phases: Assessment, Analysis, Action. A facilitated exercise requiring your participation to reveal details about your brand’s 4 BrandGPS® Waypoints: Category, Identity, Performance & Emotion. These Waypoints become the foundation of the brand strategy and guide us through a long-term strategic plan. Determining hidden and untapped potential for your brand and your company. We identify the coordinates that create the balanced intersection of business, story & aesthetic. This defines your Unique Brand Proposition, and becomes the foundation for all strategic brand communication. Creating a roadmap and strategic plan for the long-term evolution and growth of your organization. This leads to sustainable brand equity and compelling brand communication. 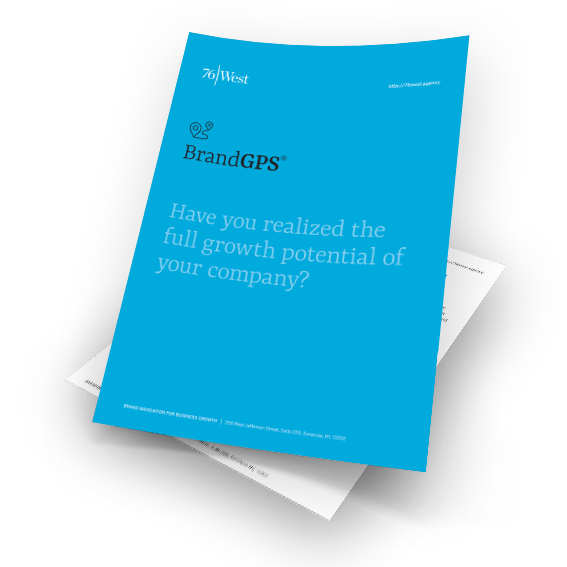 If you'd like to learn more about the 76West BrandGPS platform, and how it can help your business develop a strategic plan for growth, complete the form below for a free download PDF.